nicht erforderlich. Es eignet sich sowohl für das Selbststudium als auch für den Unterricht und wird ergänzt durch ein Stichwort- und ein Vokabelverzeichnis sowie einen Lösungsschlüssel. Abschließend werden die Lektionstexte in arabischer Schrift wiedergegeben. This book is a basic course of Moroccan Arabic. Moroccan Arabic is the language used in Morocco for every day communication, but it is understood very well in Algeria as well. With this text book anyone can learn to speak and understand Moroccan Arabic. No prior knowledge of Arabic is needed, just the motivation to learn the language. The course aims at practical communication skills. After finishing this course the learner will be able to have simple conversations about everyday life with speakers of Moroccan Arabic. All explanations are very explicit with many examples, so a teacher is not absolutely necessary. With the help of a native speaker for pronunciation and conversation, any experienced language learner should be able to reach a certain level of communicative competency without taking formal lessons in an institution. This course is based on a grammatical approach and a notional functional approach. Grammar explanations and exercises are necessary because of the big difference in the grammatical system of Arabic as a Semitic language and German as a Indo-European Germanic language. A notional functional approach leads to learning results that are practically applicable since they aim at language use in everyday life. The vocabulary presented in this course is also aiming at practical topics like food, housing, family life, work environment etc. Moroccan Arabic in this course is written in an easy to learn transliteration, so the learner does not have to invest many hours in learning the Arabic script. Given the fact that Moroccan Arabic is only a spoken language, learning the Arabic script would be a loss of time. There are pedagogical reasons for this too. These are mentioned in the book. However, the listening texts in the course are also printed in Arabic script in the last part of the book. This course contains a huge number of exercises. Almost all of these exercises have a communicational component, in addition to the grammatical or notional/functional component and for almost every exercise there is an on line available recorded sound file with all the dialogues, interactions and sentences. Communication is the main learning goal. Jan Hoogland was born in 1957 in Rotterdam, the Netherlands. Between 1976 and 1983 he studied Arabic language and literature at Utrecht University. In 1984 he became associate professor of Arabic at Radboud University, Nijmegen, the Netherlands. Between 2009 and 2015 he was director of the Netherlands Academic Institute (NIMAR) in Rabat, Morocco. He has published articles on Arabic linguistics, and a dictionary of Modern Standard Arabic and Dutch (which formed the basis of the 2014 Oxford Arabic English Dictionary). In 1997 he published the Dutch edition of a text book to learn Moroccan Arabic. In 2016 the German translation of this book appeared. 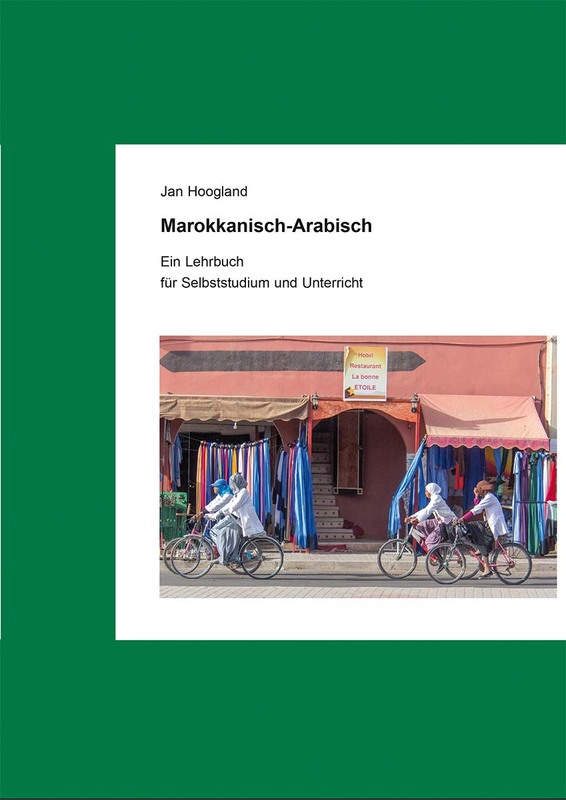 Research conducted by Jan Hoogland concentrates on the following themes: Lexicography of Arabic, Moroccan Arabic (Darija) in all its aspects, the linguistic situation of Morocco.